Welcome to the OFFICIAL Famous River Hot Dog Man website! 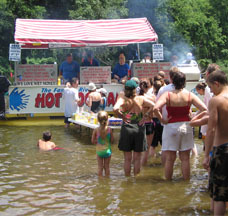 The Famous River Hot Dog Man is a MUST STOP attraction for families and groups that come tubing, rafting, canoeing, and kayaking down the Delaware River. 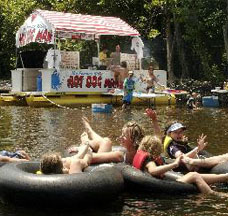 Don't be left out from getting a chance to hang out with the Hot Dog Man and make sure to check out our cool river tubing attractions! 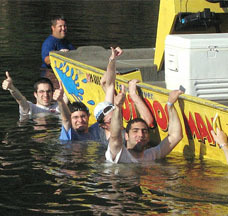 AS SEEN ON THRILL LIST..."THE JERSEY HOT DOG RIVER MAN"
BOOK YOUR RIVER ADVENTURE TODAY TO VISIT US! WEEKDAY TUBING ONLY $18.95: BOOK AND PREPAY BEFORE MARCH 31, 2018! 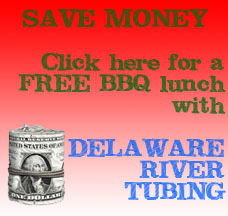 FREE BBQ MEAL: Exclusive Delaware River Tubing package with included Famous River Hot Dog Man BBQ meal! 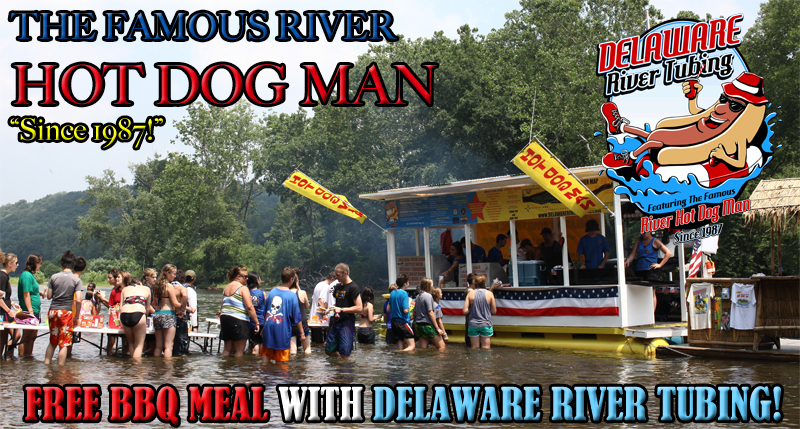 Tubing with the Hot Dog Man is a MUST: Visit Delaware River Tubing and receive a complimentary meal package! Even if you're just tubing, rafting, canoeing, or kayaking down the river with another outfitter or by yourself, the Famous River Hot Dog Man is a great place to stop and hang out to eat. If you don't stop, you're NOT tubing the right way! Great customer service, high quality and tasteful food, and a beautiful view of the river and our Adventure Island is something you will remember for years to come! Take a picture with the Hot Dog Man while you're here as well! Safety is #1: For group leaders and family members of the individuals in groups, we know that safety is a huge concern, especially when participating in aquatic water activities. The Famous River Hot Dog Man has been operating since 1987 with nothing less than 100% board of health inspections. The food is clean, fresh, and delicious! Our employees maintain the highest standard in hygiene and cleanliness. Huge Selection in Food: Although hot dogs are our specialty, the Famous River Hot Dog Man has expanded to much more than hot dogs! We have something for everyone, including delicious chicken sandwiches, kosher hot dogs, nachos and cheese, and veggie burgers. 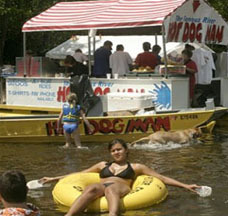 Unique Fun: The Famous River Hot Dog Man is located on the Delaware River and can be seen when tubing down the river about halfway on any tubing, rafting, canoeing, or kayaking river outing. Adventure Island is where tubers and rafters will find this hideaway cove. Patrons can eat or hang out at our picnic tables located in the water, skip rocks, explore the island, enjoy the view, sleep in hammocks, and swim at our location. No where else has an all natural surrounding that can be enjoyed anywhere else, miles from where President George Washington crossed the river and in between New York, New Jersey, and Pennsylvania! Contact Us: If you have any questions or comments, please contact us.